For creating and sustaining networks with internal and external customers. However, poorly managed meetings lead to a loss in productivity and are recognised as a major source of occupational stress. Meetings can also have a negative effect on employee morale and teamwork when managers use them to exercise power over others or pursue their personal agenda. Meetings are also one of the most expensive means of communication in organisations when employees’ time, salary and productivity are taken into consideration. The ability to lead an effective meeting is a key managerial competence. 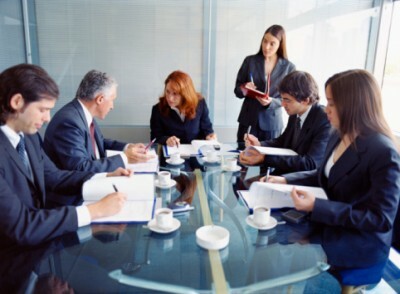 Meetings are where a manager’s leadership style and abilities are most clearly visible. Managing effective meetings involves a set of important managerial skills which are often overlooked in the development of managers. The need to hold the meeting, who should attend and what objectives are to be achieved should be clear from the beginning. Meetings should be avoided if the matter can be managed more effectively and economically through other means like e-mail, phone calls, memos or reports. One of the main reasons meetings fail is because participants do not have a clear understanding of why they are attending and thus come unprepared. A detailed agenda listing all the items to be discussed should be created and distributed before the meeting so what is to be accomplished is clear to all participants. This will allow them the necessary time to come prepared and ensure there is appropriate participation in the meeting. The duration of the meeting must be decided beforehand. Time management is critical to maintain credibility. Meetings should always start on time so latecomers will be reminded of the seriousness of scheduling. In addition, it is counterproductive to run meetings longer than necessary because people can become irritated and distracted, which can impact the meeting’s outcome. Also, meetings that are held long after normal working hours can easily stress out participants who have other responsibilities and commitments. Their concentration levels will be affected, leading to poor-quality decisions and discussions. Meetings can easily go off track, especially if unrelated issues, petty arguments and disagreements are not properly managed and controlled. When meetings lose focus, they will not achieve their intended goals and leave participants feeling dissatisfied. This is where the manager’s leadership skills and assertiveness are needed to keep the meeting on track. The choice of venue can signal the importance of the meeting to participants. At least, it should be held in a clean place with adequate seating and without any background noise or other distractions that would make it difficult to conduct an effective meeting. Most meetings result in follow-up action, tasks and specific assignments for participants to perform. Thus it is vital for brief, concise and accurate summaries of discussions, outcomes, assignments and decisions made at the meeting to be recorded. These minutes must be sent to all participants soon after the meeting as a source for reference and to monitor necessary follow-up actions. The manager in charge of the meeting must conclude it properly by recapping key concerns, assigned tasks and follow-up actions. It is also important to ensure that the purpose for which the meeting was called was achieved. By putting consistent effort into organising meetings, managers can ensure that the benefits attained are worth the organisational time invested in them.